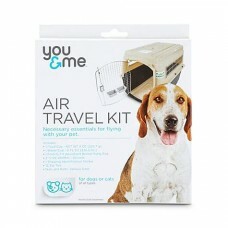 The You & Me Airline Travel Kit for Dogs or Cats prepares your furry friend to fly the friendly skies. This travel kit comes with almost everything you'll need to keep your pooch as comfortable as can be. This set features two water or food cups, absorbent potty pad and identification stickers for your dog carrier. Included hardware and zip ties help you alleviate any last minute worries when you're at the gate.